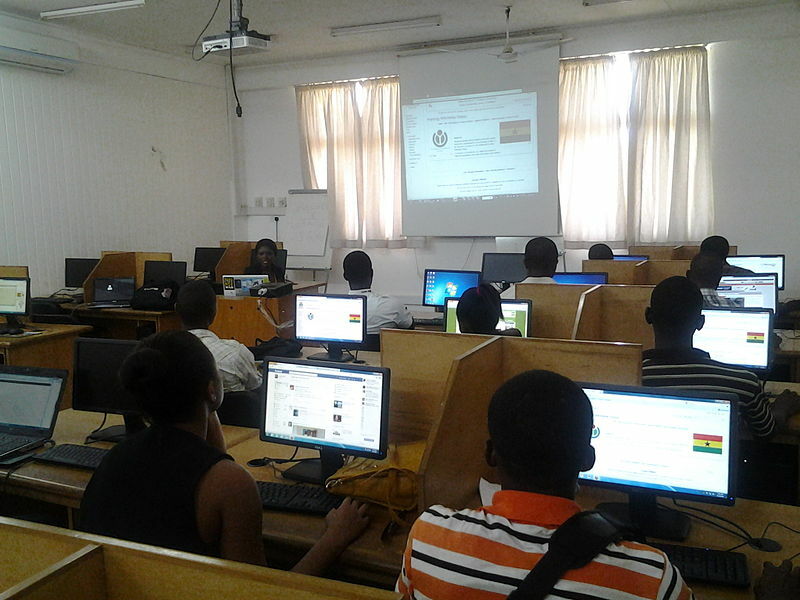 A computer lab at the University of Ghana. Photo by SandisterTei (Creative Commons BY-SA 3.0). Ghanaian citizens and political advocates took their government to court over plans to implement a so-called “Common Platform”, a technical system that would allow regulators to monitor revenues accrued by telecommunication companies operating in the country. Challengers say the system will monitor more than just revenues, warning that it will allow for easy government snooping on calls and messages. Officials say they want to implement the system in order to monitor telecommunication companies in Ghana and ensure they are paying the right amount of taxes. The platform is owned and operated by a third-party company, Kelni GVG. In July, two petitioners, Sara Asafu-Adjaye and Maximus Ametorgoh, appealed to the Human Rights Court in the capital, Accra, to hear their case. They argued that the system would infringe upon fundamental rights to privacy. The petitioners work in the technology and design sectors. If and when it is implemented, the Common Platform will be operated by Kelni GVG, under contract with the government. The company will have the ability to connect with communication systems of telecommunications companies and access their revenue patterns, in what appears to be an effort to increase tax revenues from the telecommunications and internet sector. When the third party connects its monitoring system node to the network of the telecommunication companies, they have access to both revenue accrued and all the data of subscribers including the content of voice calls and text messages. Multiple other groups have spoken out against the plan, including Occupy Ghana and the IMANI Centre for Policy and Education, which raised concerns about the privacy dimensions of the plan, and the business interests of government and corporate actors who will benefit from the Kelni GVG contract. Parliamentarian Ras Mubarak has also threatened to sue the government and telcos if the deal goes through. On Facebook, Gyebiba Ebony raised the question of what constitutes the privacy infringement with the Common Platform and compared this to a breach of privacy by some social media platforms. But the Human Rights Court in Accra, Ghana dismissed the petition raised by Asafu-Adjaye and Ametorgoh. In the ruling, the court indicated that the two Ghanaians did not provide any real evidence to back their claims of privacy breach if the Common Platform should be implemented and that their argument was based merely on public sentiments and debates. Franklin Cudjoe, a major supporter of Asafu-Adjaye and Ametorgoh's petition and the executive director of IMANI, indicated that the telecommunication companies did acknowledge that the Common Platform, when implemented, has the tendency to breach customer privacy and that the court ignored this evidence in its the ruling. Emmanuel Kyeremanteng Agyarko, a member of parliament, argued that the tendency of a platform to cause a breach of privacy does not mean it will, by all means, breach privacy. The Common Platform is likely to be implemented regardless of the final hearing because the court indicated that the State could suffer irreparable damage if an injunction is granted. The petition submitted by Asafu-Adjaye and Ametorgoh was dismissed as of July 10, 2018. But opposition from civil society and even some legislators can be expected to continue.